I can’t even deal with how much I love pears. Peaches are wonderful, yes, but biting into a juicy, ripe pear is something else altogether, such an unexpectedly complex sweetness. I love how earthy and rustic they are, and I always want to put them with things like cardamom, goat cheese and red wine. 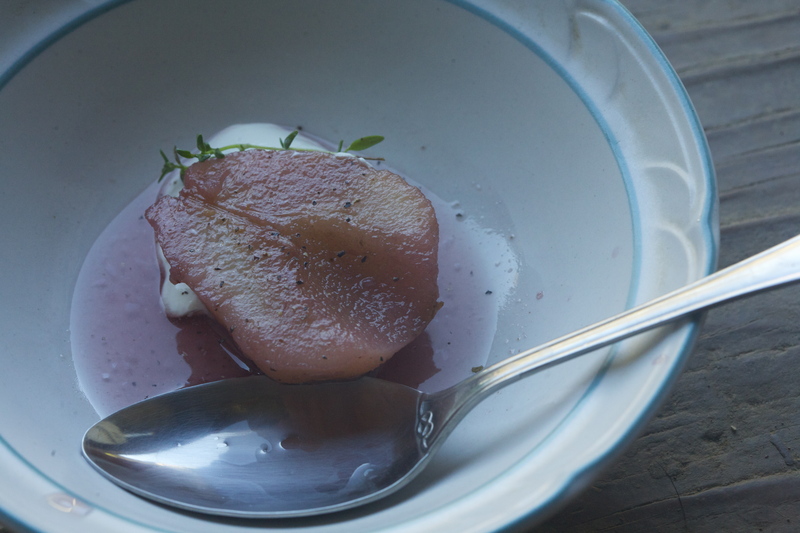 This recipe calls for seckel pears, a variety much smaller that the typical barlett or d’anjou, so they make the perfect little spoonful of something sweet. Really, all it entails is canning some pears, but I’ve switched out some of the water for zinfandel and added a few spices. They’ll be the perfect thing to have stashed away for the holidays in case I want to need something ridiculously fancy to impress guests. (It’s horrible but true, depending on who you’re talking to… “You brought store bought pumpkin pie? That’s so… nice…. I brought seckel pears poached in zinfandel with nutmeg and orange zest.” It’s even better if you can say “I grew them myself” or “They’re organic” but you have to be careful that someone doesn’t just end up punching you in the face for sounding too much like Gwyneth Paltrow. (an example from her blog: “As a home cook, one of the best things I’ve ever done was to build a wood burning oven in the back yard.” Great, thanks for the tip, Gwyneth). For the rest of us that aren’t rolling around in piles of money, this project is equally fancy and only costs about $15. Bring boiling water canner to a boil. Sterilize jars and lids. In a large, nonreactive pot, combing water, wine, sugar, nutmeg, bay leaf, and orange zest and bring to a boil. Simmer for five minutes, then remove the bay leaf and turn the heat to very low. Peel, half and core the pears. Gently toss in a bowl with 1/4 c. lemon juice to prevent browning. Transfer the prepared pears to the pot with the red wine syrup and gently simmer them for five minutes. Use a slotted spoon to lift the pears out of the syrup and then pack the hot pears into hot jars. Ladle the red wine syrup to cover the pears, leaving 1/2″ head space. Remove air bubbles from the pears by gently running a plastic spatula around the edge of the jar. Adjust the head-space if necessary.Wipe the rims clean and screw on the jar lids. Process quart jars for 25 minutes if your altitude is 0-1,000 ft., 30 minutes from 1,000-3,000 ft., 35 minutes from 3,000 to 6,000 ft., and 40 minutes above 6,000 ft. (What about on top of Mt. Everest? Doesn’t it seem like it should be way longer? The answer: I have no idea). I’m not fan of really rich, filling desserts. If you want something a little lighter and more elegant, try plating some pears with whipped cream or creme fraiche, fresh thyme, and black pepper, maybe a drizzle of honey. You could flesh this out into a really nice cheese course by adding some manchego and a few pieces of dark chocolate. They look wonderfully delicious. We grow Asian pears in our back yard. The first time I’d heard of Seckle pears was in Williamsburg, Va a couple of weeks ago. Someone had made a pie with them. Do you raise your own pears and are they available at farmer’s markets, etc.? I am trying to decide what to do with the seckels I picked up at the farmers’ market last weekend. I was thinking of going plain, but this is mighty tempting. I see most–but not all–people peel them. I might try one jar unpeeled as a test. I got some merlot and seckle pears on sale. Going to give it a try even though I bought the “wrong” wine. laura- that’s great! i’m sure merlot will be fine. have fun! 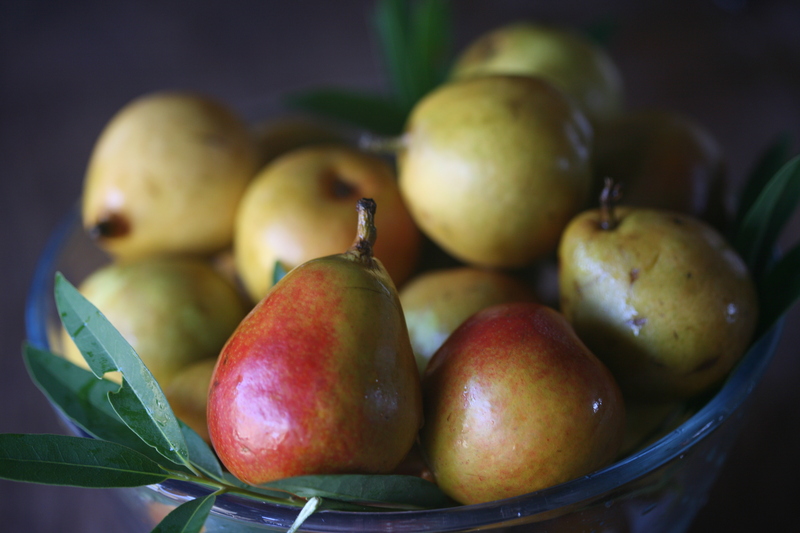 I have a bumper crop of seckel pears this year and I tried your recipe. I used a local dolcetto for the wine. The results are delicious. 6 pints put up! More to come! Thanks for this. This pear recipe is in the canner right now and I know they are going to be delicious, because I tasted them! I’m not sure I have seckel pears. I picked them off a neighbors tree and they are very small, 3-1/4″ circumference and are not at all juicy. They also are too small to peel, which is fine with me. I live in southwest Colorado where things only survive if they don’t need water. Using this recipe gave the pears a lot more flavor and I’m anxious to serve them for dessert. If you’re not going to can them but eat them fresh, is there anything you’d change to the process, or is canning a must? 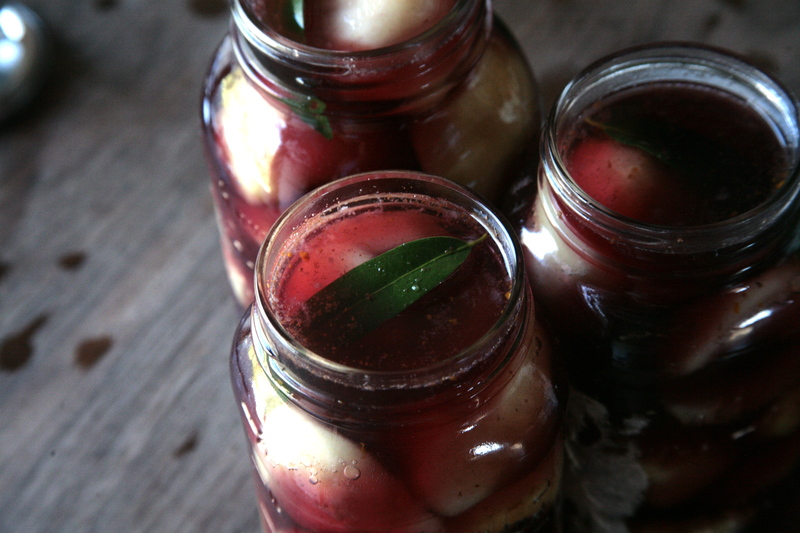 Not sure that I have enough of the pears to justify canning – not that I even have a canning set up. Thanks!